In 1982 Sant Bhindranwale launched the "Dharam Yudh Morcha". These were peaceful protests to support the implementation of The Anandpur Sahib Resolution. During these "Morchay" thousands of Sikhs courted arrest. Kuldip Nayar (respected journalist) wrote, "When the agitation began nearly two years ago, it was led by reasonable men seeking a reasonable settlement of reasonable demands, and at least three times there were prospects of agreement at a negotiating table but each time Prime Minister Indira Gandhi sabotaged the 'agreement'." After nearly two years of peaceful agitations, approximately 200 Sikhs were killed by the security forces and over a hundred thousands Sikhs had courted arrest. However, all negotiations with the Government had failed, the Akali Dal (Sikh Political Party in Punjab), called for the next stage of civil disobedience which was to withhold the grain distributed from Punjab to the rest of India. 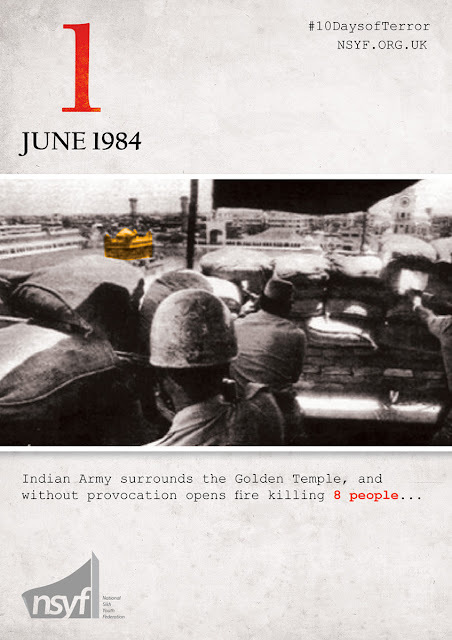 This was to be done on the 3rd of June 1984, in a means of pressuring the Government . Knowing that this would force settling with the Sikhs, the Indian Government instead of negotiating, opted for a military option (Operation Blue Star) which had been prepared for over a year earlier to crush and silence the Sikh agitation. Tens of thousands of army troops were deployed and on the 1st June Sri Harmandir Sahib (The Golden Temple) was surrounded. The Border Security Force and the Central Reserve Police Force, under orders of the Army started firing upon the Complex, in which at least 8 People died. The Battle of Amritsar had begun, #10DaysofTerror had started.